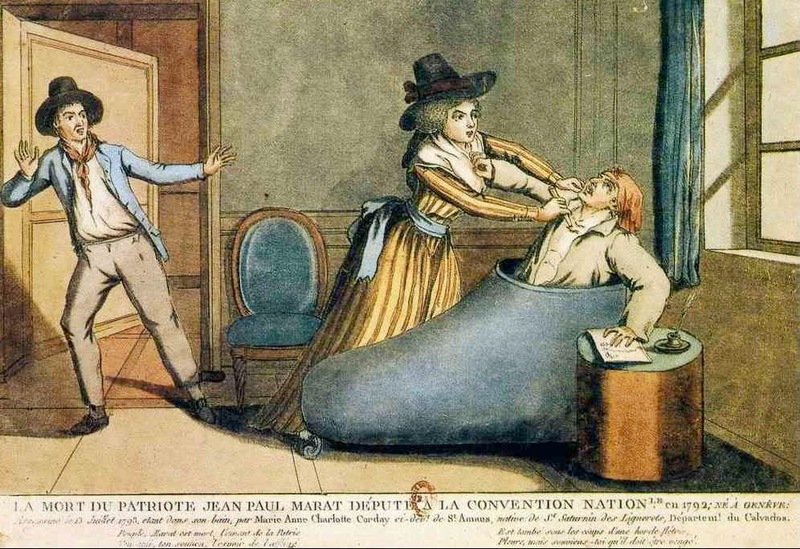 The obvious counter example is David's Death of Marat, especially disturbing since David was one of a delegation from the Jacobin Club who came to inquire after Marat's health on the day before his assassination. It had been David who reported that leprosy covered the body of the Friend of the People, and that his blood was burning. (Moniteur, session of 15 July). However, David's painting shows neither Marat's leprous scabs nor the shirt he was wearing nor the clots of blood which so unpleasantly mingled with the bath water in eye-witness accounts. Artistry also presumably excluded the rather ridiculous copper clog shaped bath, which metamorphosised into a much longer, discreetly drapped affair more in keeping with David's heroic vision. No doubt Marat's real bath was indeed a "sabot" one. The real problem is simply that the design, being sensible, was quite common; it used a minimum of water and conserved heat. One might suppose it was particularly popular among invalids like Marat who soaked in their baths for extended periods. 2. "On its upper side it has two little crotchets which might serve to make a reading-desk". It is quite hard to know what exactly this means. Did the bath have some sort of extension, or maybe a desk could be fixed on to it in some way? Contemporary illustrators agreed that Marat worked on his papers in the bath but, judging by the variety of depictions, they were unsure of his exact arrangements. 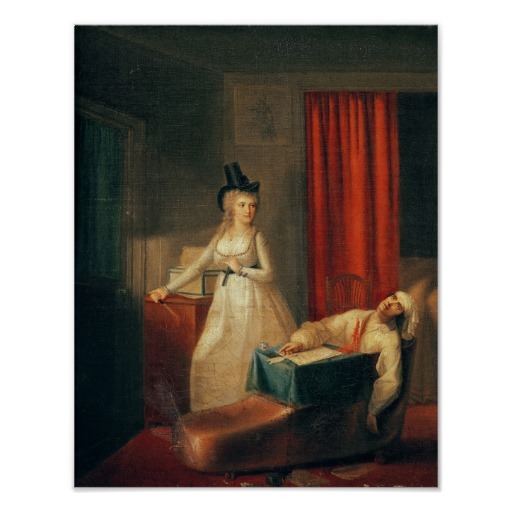 Detailed accounts in fact suggest that the bath was a new departure and Marat was just working from it in a relatively spontaneous way. When the Jacobins visited him he had been confined to his bed with a fever for some time, so they were quite relieved to find him up, ensconced in his tub: "We found him in the bath: a table, an inkwell, newspapers all around him, occupying himself ceaselessly in the public cause". 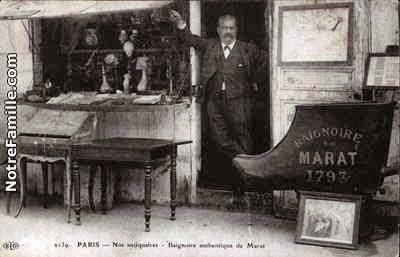 Marat's writing desk, on prominent display at his funeral and later in his memorial, corroborates this idea. It seems to have been just an ordinary table; there was no implication it was attached to a bathtub or adapted in any way. 3. "A sort of copper stool is fixed to the bottom of the bath, which permitted the person who was using it to remain seated and to write easily. Under this stool was placed the apparatus to heat the bath". This doesn't get us very far. I assume baths of this sort ordinarily had somewhere to sit? The heating apparatus is surprising; I imagined you just filled the tub with hot water from a kettle. But in any case, it is quite clear Marat had no use for HOT baths, plagued as he was by fevers and fiery itchy sores. 4. "Time, one may say, has engraved its imprint in singular fashion on this homely bronze. It is highly probable that, since July 13, 1793, Marat's bath has never been sullied by the contact of water. The stains of the tribune's blood ought to remain there still. In any case, one sees distinctly encrusted the horizontal traces of the sulphurous drugs of which the baths of the Conventional, attacked, one knows, by a skin disease, were composed." So a hundred-year old bath has some nasty stains? Hardly surprising, really. It is a pity there was no blood and we can't do a DNA test. The conclusion? I'd say pretty iffy. I think it is worth remembering though that the bath is more part of the myth of Marat than a relic of his actual life. If he hadn't been stabbed in the bath, and depicted dead by David in one of the world's most arresting images, the bath would be just a forgotten domestic detail; whether the bath we have is "real" or not doesn't matter much - what is "real" anyway? Voltaire and the "Enigma of Sellières"
On the road - the "Turgotines"